Whenever there’s a huge multiple days long power outage in a major city here, there’s always two types of photos that make their way to the internet. One of a house or shop that still has power and invites everyone to charge their phones on a series of extension cords. The second is the picture of the stationary bike generator. With the Bicycle Handlebar Portable Wind-Powered Generator Lamp, you can be your own generator with no need to stay stationary. It is a little wind turbine. 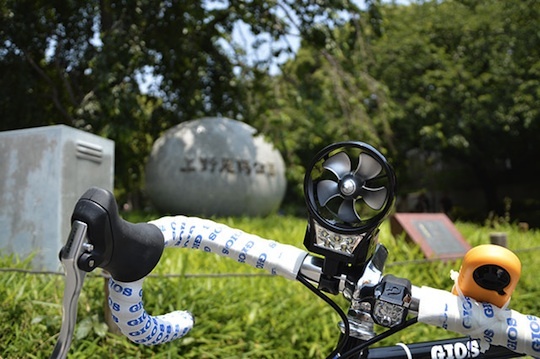 A little mini wind turbine that snaps onto any bike you have, and then creates electricity generated by the wind rushing past as you ride along. You can then use this power to charge your USB devices. So phones, music players, etc. Or, and this is a neat addition, you can pop two rechargeable AA batteries in there that can be used for other devices that are stuck in 2005. The generator is also a lamp, so on its own it can still be useful. The Bicycle Handlebar Portable Wind-Powered Generator Lamp is $100.